8mm Forum: My Elmo 16CL was noisy. Worm gear issue? This is topic My Elmo 16CL was noisy. Worm gear issue? in forum 16mm Forum at 8mm Forum. 1. Is this worm gear issues? 2. If no, what do you think? 3. Is worm gear for Elmo something difficult to find ? How much? 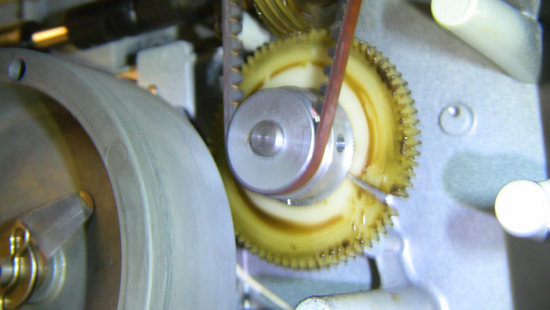 Replacing the worm gear is easy, but calibrating the projector afterwards is not. You'll need a pro to fix that. Hi Winbert...Since the Worm gear on the Elmo 16CL is metal it's unlikely that it is cracked. However the gear directly below the worm gear that the takeup belt attaches to could be cracked. I had this situation a few years back. When I received the projector it had a clunking sound when running. I discovered the cracked gear after removing the metal housing that covers over the worm gear section. I was able to locate a replacement gear and installed it myself. There was no adjustments or critical alignment necessary. I found the problem, it is the cooler motor's cover (sitting on the front lower side of the projector) that due to the age, has been pressed to the inner side resulting it touched the blade's (?). I put a small 0 ring to give more gap between the blades and cover, and it does not make anymore sound. Thanks Janice for the info. I just had that same gear break on my Elmo 16CL(TC) projector yesterday. I have several 16CL projectors here so I used one to salvage that gear to use. One thing I noticed when doing the repair is if the gear isn't pushed back far enough on the axle before locking down on it, the axle can move back towards the front of the projector and lock up where the pulley wheel mounted on it and if that happens the metal worm gear will snap this more fragile plastic gear instantly. 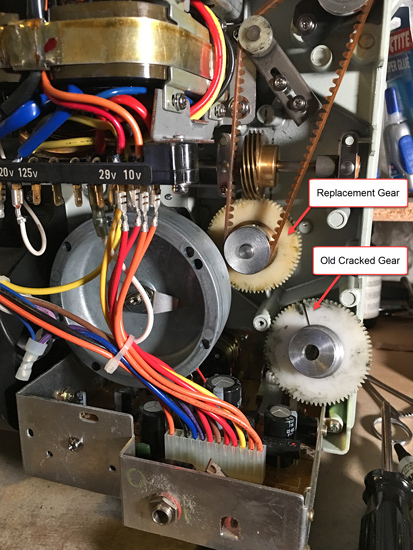 Urbanski Films recently posted a YouTube video called "Elmo 16-CL projector rear arm repair/rebuild" which helped with the gear removal. Any ones knows where to get them ? Some of the handy parts they do there are amazing and great for the hobby. Might help keep us all trundling along. Yikes! Mine broke December 28, 2018! I was showing a soundie w Cab Calloway and the voices were way out of sync. With every “clunk” the lower loop of the film got longer! I tried to clamp the gear in a hose clamp and epoxy it to no avail. I ordered the part from VaN Eck —should be in in a week or so. I noticed that lower sprocket is on that shaft and moves with it—should I make sure it’s tight? Or should it have a little lash?